With highways that are lined with jagged cliffs, winding roads over high-alpine passes and deserted back roads from the desert, accessing Aspen can be nearly as memorable as the time spent once you arrive. There's no question that once a visitor arrives in Aspen they will be blown away by the myriad of things going on in town. The endless dining options, renowned nightlife, world-class cultural events and pristine trails to explore via foot or wheel are well-documented. However, one aspect of the Aspen experience that deserves a bit more attention is how to get there. Here are five drives to Aspen that double as terrific day trips. A majority of visitors to Aspen originate in Denver, or Colorado's Front Range, having flown into Denver International Airport (DIA) or residing in a city or town along the eastern edge of the state. Without question, the can't-miss drive to Aspen from the Front Range is over Independence Pass (via Hwy 82, which is open during non-winter months). 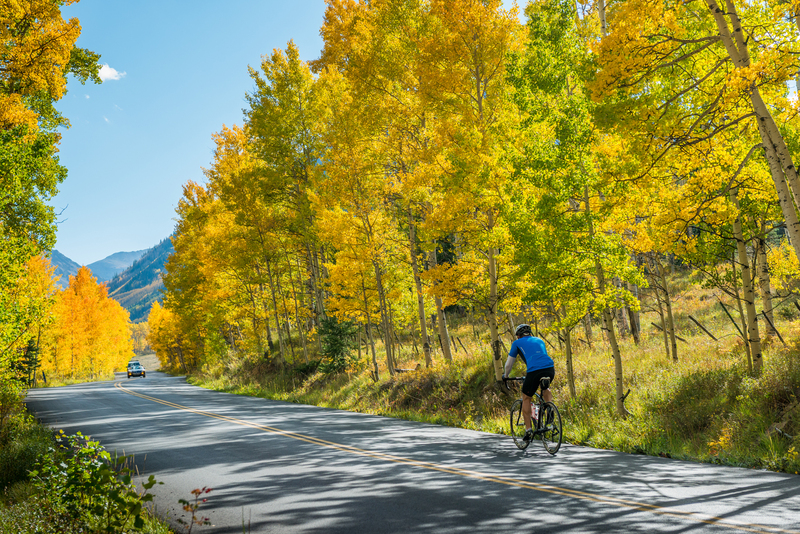 A handful of gorgeous roads lead to Indy Pass, like the high-plateau plains of Jefferson and Grant along Hwy 285, driving alongside the Collegiate Peaks near Salida and Buena Vista, and the switchback turns on Hwy 24 from Minturn — all part of the Top of the Rockies Scenic Byway. Be sure to have your camera ready as you pass Twin Lakes and descend toward Aspen: The countryside over Independence Pass is stunning! If you're in southwest Colorado and looking for a picturesque way to get to Aspen, be sure to hit Hwy 133. Dense groves of aspen trees color the roadside over McClure Pass, the ominous peaks of Mount Sopris and Chair Mountain make up panoramic views as you crest the pass and descend into the Roaring Fork Valley, and as you drive along the Crystal River you'll pass the historic town of Marble, small-town Redstone and charming Carbondale. And, Hwys 24 and 285 from southeast Colorado will place you amid the highest concentration of 14,000-foot peaks in the country, pass Colorado's whitewater rafting and kayaking mecca — the Arkansas River — and run alongside some of the best trout fishing in Colorado. For those in the west and headed east along I-70 across the Utah desert, the back roads surrounding Moab are the best way to break the beautiful monotony of the desert. Hwy 191 takes you past Arches National Park and toward Moab, and as you cross the Colorado River you'll see Hwy 128. Take a left and follow the river through canyons and rolling red-rock desert, past towering spires that will leave you in awe. The drive through Castle Valley and Dewey, Utah is one of the best-kept secrets in the Wild West. Though this detour adds about two hours onto your drive, you won't be disappointed. Plus, the wineries in Palisade, Colorado — which you'll pass en route to Aspen — produce some of the best wines in the state. If you're Aspen-bound from northeast Colorado — like Estes Park, Loveland, Fort Collins, or Greeley — Hwy 34 bisects Rocky Mountain National Park. Known as Trail Ridge Road, the highway promises incredible panoramic views of mountains, loads of wildlife and endless meadows of wildflowers. Eventually, you'll pass through Grand Lake and be able to trace the headwaters of the Colorado River from this charming resort town to a gravel road through spectacular Upper Gore Canyon. Read up on where to stay once you arrive, ways to experience Aspen in the summer and iconic places to snap a photo in the area.